Their repertoire includes both traditional and classical material, operatic and musical theatre items. Competition successes have included Male Choir of the Year, the Welsh Choral Challenge Shield, the National Eisteddfod, the Malta International Choral Competition and the International Choir Festival of Jersey. The choir has given premiere performances of works by contemporary Welsh composers including Mervyn Burtch and Richard Roderick Jones. A performance of Beowulf And Grendel - a large work by Mervyn Burtch for male voices and brass band - resulted in the choir being given the 1997 W S Gwynn Williams Award in recognition of its contribution to music making in the community and its continued promotion of new Welsh music. In November 2000 the choir was invited to perform the cantata Owain Ab Urien as part of a centenary celebration of the Welsh composer David Wynne. The choir is also renowned for its theme concerts, one of which was adapted for a feature-length television programme. Other television appearances have included The Magic Of The Musicals which featured Bryn Terfel, Peter Karrie and Catherine Zeta Jones; an appearance on the National Lottery's first birthday broadcast; and a performance on GMTV's Breakfast Show. 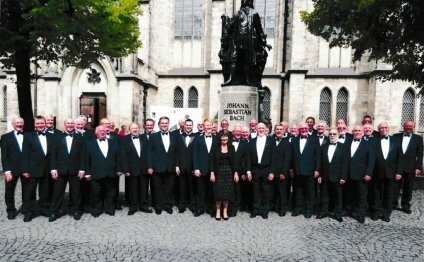 In January 2000, Risca Male Choir also took part in the BBC's Millennium Songs of Praise from the National Stadium in Cardiff. The choir is featured on a CD entitled We'll Keep A Welcome, along with Bryn Terfel, the Orchestra of Welsh National Opera and the Black Mountain Chorus of Wales. The recording was released by Deutsche Grammophon in 2000, and quickly went gold. Pontnewydd Male Choir One Voice.